Jim Jarmusch's idiosyncratic western plays like a delirious Coen Bros. movie, which also fits into the auteur stylings of the man whose Stranger Than Paradise and Down By Law are two of the best movies in a dismal decade. In Dead Man it's much the same, but set in the western frontier. Johnny Depp plays an accountant from Cleveland named William Blake, who travels west for a new job but becomes an outlaw on the run from a maniacal trio of desperado hit men. It's a great cast, with the core relationship being Depp's character and a wandering Indian (Gary Farmer), who combine to form a unique cinematic buddy relationship. It's a great heartwarming performance from Farmer inspiring every other supporting character. Look out for Robert Mitchum at his grizzled best playing the loose cannon entrepreneur hunting down Blake. The trio of Billy Bob Thornton, Iggy Pop and Jared Harris makes a great sequence in itself. Iggy Pop wearing a dress is weird enough to capture our attention, but look for a then unknown Billy Bob, who steals the scene. Mixed into the thought provoking Native American mysticism of Gary Farmer are some very bloody death scenes and set pieces of rather shocking violence. Gabriel Byrne's brief appearance is marked by an inspired gunfight and two awesome death scenes. Robbie Muller's black and white photography is beautiful, evoking the idiosyncratic mood of Jarmusch's early films. 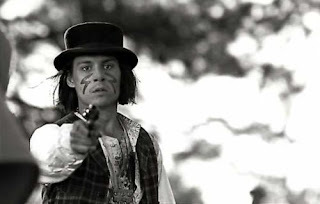 Dead Man is memorable because there's just something not right at every turn in this picture - Eugene Bird playing a black hit man for sure, Crispin Glover playing a batshit crazy train porter, Neil Young's whiny guitar score and even the fade outs, which mark the beginning and ending of each scene. And yet we wouldn't want anything normal or expected in this film. It's a haunting, beautiful and strange cult classic. Dead Man is available on Blu-ray from Alliance Films in Canada.